New Year's Eve, also called Old Year's Night, is celebrated on December 31st, the final day of the year. It is celebrated all over the world with parties and social gathering with usually a lot of fireworks and noise. In the United States of America, New York is the place where this celebration is associated with. 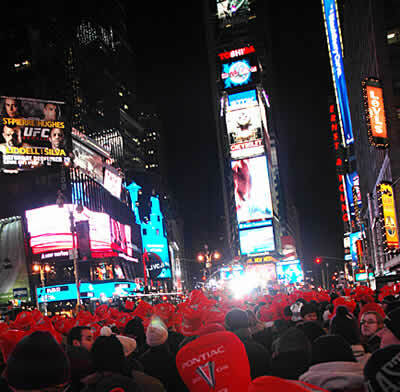 People gather in the Times Square just before midnight in the last minute of the countdown to see the "ball dropping". The celebration is also associated with parties in other parts of the world. In France, for instance, the celebration is called le Réveillon. Special food is prepared accompanied with champagne. People also go to the Eiffel Tower in Paris to see fireworks display. In Japan, people traditionally clean their home. Buddhist temple bells are rung 108 times at midnight. In Brazil, the beach of Copacabana is considered by many to be the place of the most beautiful fireworks show in the world. On New Year's Eve, people commit themselves with resolutions. These are made to reform a habit and should go into effect and remain until fulfillment. What "drops" at midnight in Times Square? Where in The USA is the biggest New Year's Eve party? Where do temple bells ring 108 times?